The KQA will be hosting two open quizzes on 6th May (Sunday) at Ujjivan in Koramangala. 11 AM: The India MELA quiz by Hem Maradia – a quiz on Indian Music Art Literature and Entertainment. It is a written quiz for teams of two. Open to all. 230 PM: The KQA Lone Wolf Quiz by Navin Rajaram. A general quiz for solo participants by Navin Rajaram, who has conducted many highly enjoyable quizzes for the KQA in the past. It is a prelims/finals quiz for individuals. Open to all. If you know of anyone who would like to be a part of this WhatsApp group, please have them send a WhatsApp message to +91 9902444486. 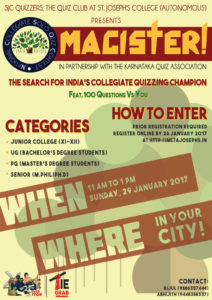 Magister 2017 is a solo quiz contest with collegiate and open tracks that will be held on Sunday, 29 January 2017 in Bengaluru, Guwahati, Hyderabad, Mumbai, New Delhi, Tezpur, Vellore, Baroda, Mohali, Pune, Mysuru, Raipur, Thrissur, Kochi, Warangal, Goa, Kolkata, Manipal, Kanpur, Pondicherry and Shillong. The quiz will require takers to answer one hundred questions off a PowerPoint presentation from 11 am to 1 pm on Sunday, 29 January 2017 (with earlier starts in some venues). The quiz is the result of a partnership between the Karnataka Quiz Association and SJC Quizzers, the quiz club at St. Joseph’s College, Bangalore. The setters are Prof. Rajeev Gowda, Arul Mani, Prithwiraj Mukherjee, Nagaratna ‘Partikal’ Patil, Avinash Thirumalai (in sublimated form), Rijul Ballal, Chirag Chittar and Abhijith Raghu. Once upon a time, every open quiz would have a sizeable college contingent in attendance and the Open circuits of India’s quizzing cities throve on the energy and dash of college quizzing. In many cities, though not all, this is a thing of the past. Which is not good news for open quizzing, or, indeed, for quizzing. The simple idea behind Magister is to bring together the two rapidly diverging streams of quizzing–College and Open. The setters are college and open quizzers. The quiz has college and open tracks for competition. The questions themselves are an attempt to start up something of a conversation between open and collegiate quizzing. You could thus say that what we want to see is a form of a Re-Open-ed Quizzing. But what the Deccan is a Magister? Magister comes from the Latin for mastery. That said, we must clarify that we are interested in more than quizzing as simple, masculine achievement. The term magis is used in Jesuit thought to indicate the spirit of doing more, or giving more of oneself. For us, this name draws some attention to the happily out-of-syllabus character of quizzing. And indeed to the primary joy of quizzing, which is that of refusing to be a passive recipient of information, and choosing instead to celebrate an active curiosity in the world. The persons who win this title in the college and open tracks will embody this idea better than our words can. If you’ve enjoyed open quizzing, support this venture by turning up and taking part! On-the-spot entries will be accepted in Bengaluru, and at the proctor’s discretion in other cities. The Bengaluru venue is Xavier Hall, St. Joseph’s College (PG Block), Langford Road. Please text 9731214519 if you have any questions. Mahaquizzer 2016 was attempted by 264 participants from 13 cities across India. Samanth Subramanian from Chennai emerged the Champion with a superlative score of 97 points. He will receive his trophy at asKQAnce 2017 – the 34th Anniversary Quiz Festival of the KQA. Debashree from Delhi won the Ladies category with a score of 64 points; Jyotesh Singh from Delhi won the college category with a score of 50 points. Our congratulations to them. The quiz was also attempted by participants in several countries and Pat Gibson from the United Kingdom recorded the highest score among all international participants, scoring 91 points. The Karnataka Quiz Association thanks all the quiz associations and quizzing groups across the country, as well as all the venue partners, for helping organize Mahaquizzer 2016 successfully. These rankings will be updated after each session of Push-ups for Muscular Success. Rankings are determined by total scores. DNA signifies Did Not Appear.